Apologies for the mini hiaus. The majority of the last two weeks was cold, overcast, and rainy (it's raining as I write this post), and Aki came down with a very bad fever that lasted five days. Not to mention, the auto-focus of my camera broke (it's in the shop now, getting fixed), and sprinkle on top of all this, the usual busy, work-related stuff. 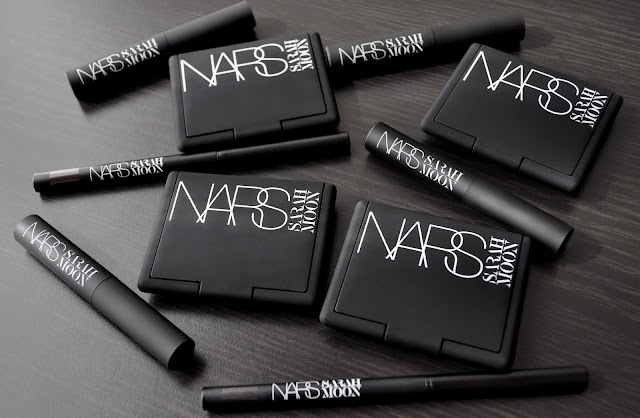 Anyway, the on-again/off-again dreary weather we've been having has allowed me to continue to use the products from the NARS x Sarah Moon Collection that I dearly love. I find the stylishly nostalgic, blurred-dream-like photography of Sarah Moon beguiling. A major fan of her work, I own four of her books (two of which I paid a hefty price for). Next time I'm in the states, I need bring them back with me. Quai des Brumes and Indes Galantes Duo Eyeshadow. 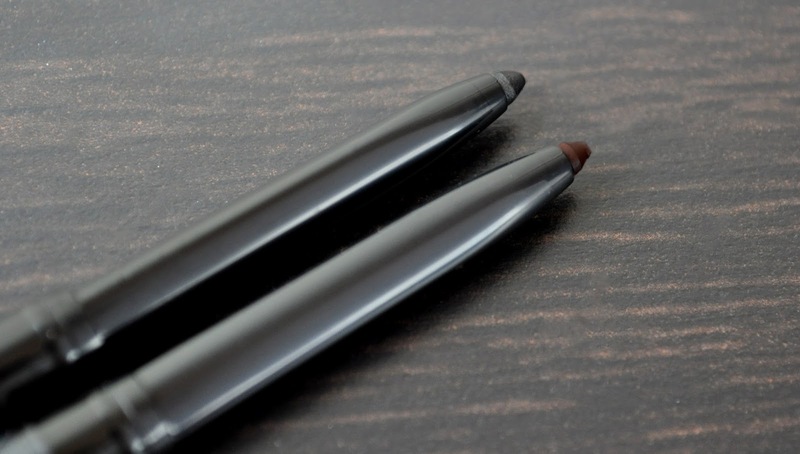 I adore the muted tones of the matte and shimmer shadows of each duo. Both Quai des Brumes and Indes Galantes shadows are pigmented, feel velvety soft, and blend well. I did notice the mattes had a little kick-up, but not to the point where you're wasting product every time you dip your brush into the pan. Quai des Brumes: a shimmery lavender grey, and a matte charcoal grey with sparse, gold micro-glitter. Indes Galantes: a shimmery dark gunmetal grey, and a plummy-maroon-burgundy matte. Witching Hour and Sichuan Kohliners. Both of these kohliners are creamy, smooth, and opaque. Their smooth, creamy consistency allow them to blend out easily on the lid, making them great bases for the duos. Also, after application, they didn't budge or fade on the upper and lower lashline, or the waterline. Nars Blushers are some of my favorites blushes. 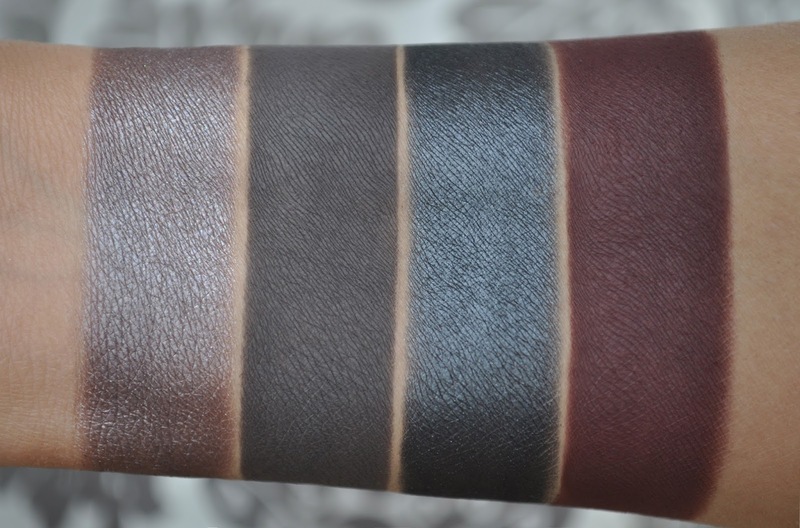 Isadora and Impudique are extremely pigmented, with a soft, velvety smooth texture that blends like butter. Witching Hour, Sichuan, Isadora, Impudique. Witching Hour Kohliner: a shimmery dark gunmetal with a hint of lavender. Sichuan Kohliner: a deep maroon. Isadora Blush: a warm, brownish-plummy-rosy with a gorgeous lavender-pink sheen. 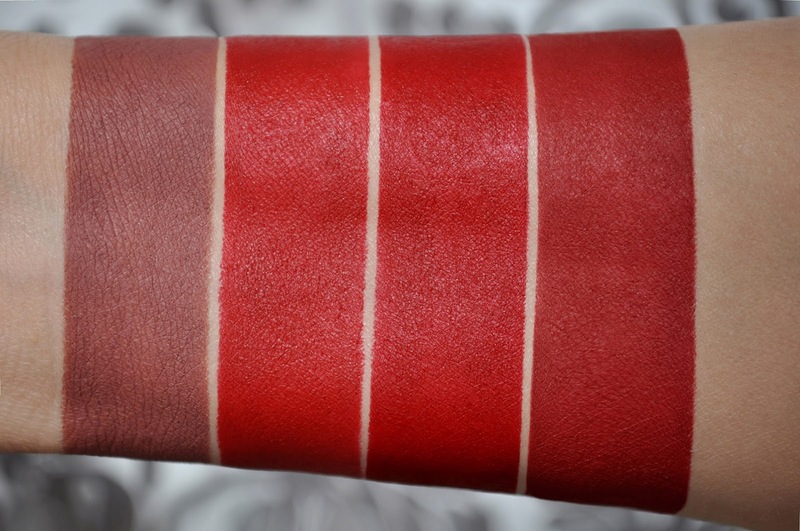 Impudique Blush: a deep, reddened-coral pink with a beautiful golden sheen. 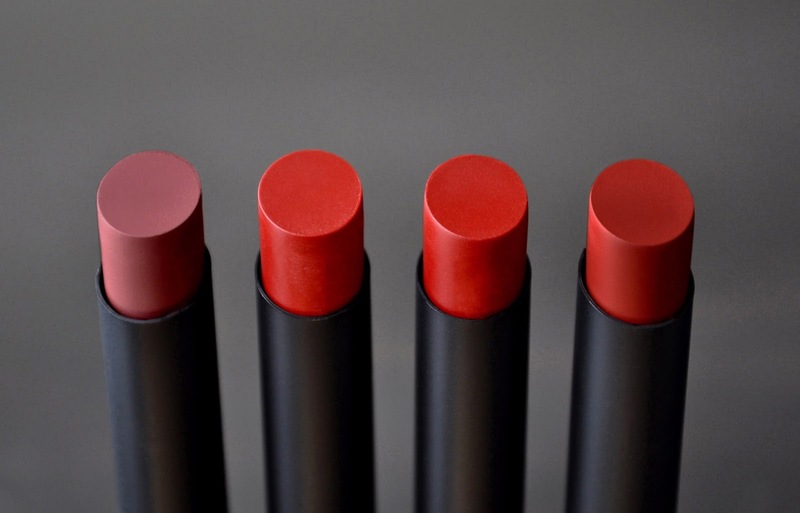 Indecent Proposal, Rouge Improbable, Rouge Indiscreet, Fearless Red Moon Matte Lipstick. With all the new lipsticks I'm continuously adding to my collection, I've totally neglected my stash of Nars Pure Matte Lipsticks; and, I forgot how much I love them. Intensely pigmented, these matte lipsticks have a smooth, creamy formula that's extremely comfortable to wear without drying out my lips. 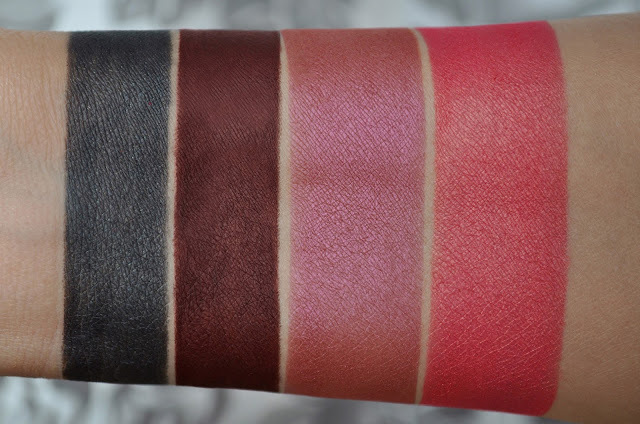 Indecent Proposal, Rouge Improbable, Rouge Indiscreet, Fearless Red Moon. Indecent Proposal: a muted, deep, plummy-rose-brown. Rouge Improbable: a deep, slightly orange leaning red. Rouge Indiscreet: a deep, true red. Fearless Red: a muted, deep brick red. Again, the auto-focus of my camera broke. Therefore, I've had to manually-focus all the pictures taken. Unfortunately, out of the four looks I photographed, only one was focused enough to post. Hopefully, I'll have my camera back the next time it rains, so I can redo the looks. Nars Soft Matte Creamy Complete Concealer in Custard (used under the eyes and as an eyeshadow base). MAC Eye Shadow in Brule (all over the lid). 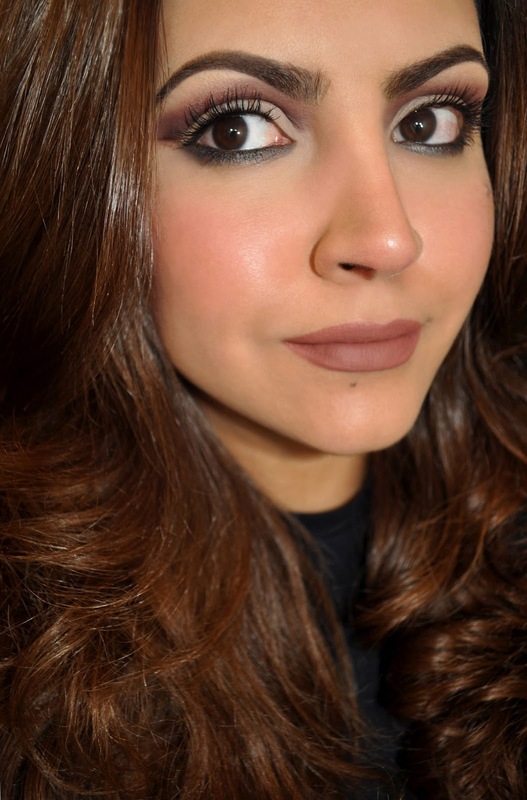 The plummy-maroon-burgundy shadow (with a light hand, softy trace the shadow slightly above the crease, and blend outward in a wing shape). The shimmery dark gunmetal grey shadow (blend from the inner and outer corner on the bottom of the lower lashes). Nars Kohliner in Witching Hour (on the waterline). Nars Moon Matte Lipstick in Indecent Proposal. a little out of focus, but that's okay. I was really excited over this entire collection. From the promotional images, exterior and product packaging, to the color scheme of the makeup itself, Nars did a superb job at capturing the melancholic, ethereal elegant essence of Sarah Moon. I'm over the moon (pun intended) for each piece in the collection, but I have a special place in my heart for the Indes Galantes Eyeshadow Duo, Sichuan Kohliner, Isadora blush, and all four of the lipsticks. Very beautiful colors! I don't know much about photo cameras, but I like the lighting in your photo. Your face look bright! Having patience, taking my time, and I used a mac 226. I dipped the the brush into the pan, making sure to pick up product on the tip only. With a delicate hand, I barely touched my crease with the tip of the brush, and lightly blended the shadow using a windshield wiping motion several times.